Thousands of pilgrims turned up at the temples to pay obeisance to goddesses Ganga and Yamuna. Dehradun: The annual Chardham Yatra in Uttarakhand began today with the reopening of the portals of Gangotri and Yamunotri temples in Garhwal Himalayas amid chanting of vedic hymns after nearly a six-month long winter break. Thousands of pilgrims thronged the two Himalayan shrines to witness the elaborate ceremonies which preceded their simultaneous reopening at 12.15 pm on the occasion of 'Akshaya Tritiya'. After prayers were offered by priests and Purohits in Gangotri, former Chief Minister and Haridwar MP Ramesh Pokhriyal Nishank and Gangotri MLA Gopal Rawat formally declared the annual yatra open in the presence of Uttarkashi SP Dadan Pal Singh. The palanquin carrying the idol of Goddess Ganga departed from her winter abode at Mukhba yesterday and reached the Gangotri temple at 9 am this morning after making a night halt at the Bhairav temple, Gangotri temple committee chairman Mukesh Semwal said. Speaking at the opening ceremony of Yamunotri, Satpal Maharaj said the pilgrimage to chardham had become difficult in the wake of the 2013 calamity but the challenges thrown up by the disaster have now been overcome and people can visit the four Himalayan shrines as well as the Sikh shrine of Hemkunt Sahib in a trouble-free manner. 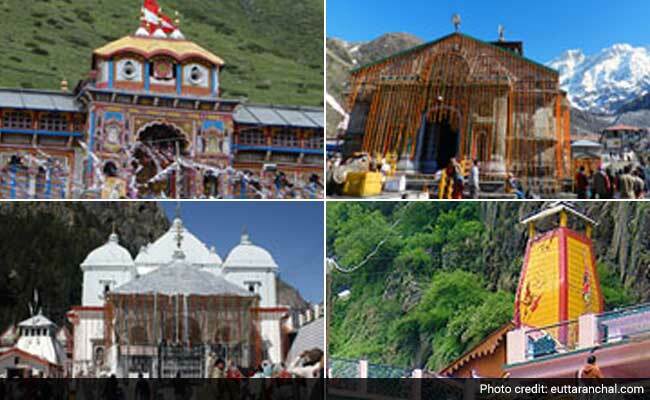 PM Modi will visit Kedarnath on May 3 and President Mukherjee will offer prayers at Badrinath on May 6.